This Valentine’s Day, instead of the usual box of chocolates, give your Valentine in your life something that will last them all year long – a healthy, beautiful smile! The Oral-B Deep Sweep is the perfect gift for your sweetheart that loves technology while taking care of their oral health. Deep Sweep removes up to 100% more plaque than a manual toothbrush, and will make his brushing experience something to say “WOW” about. 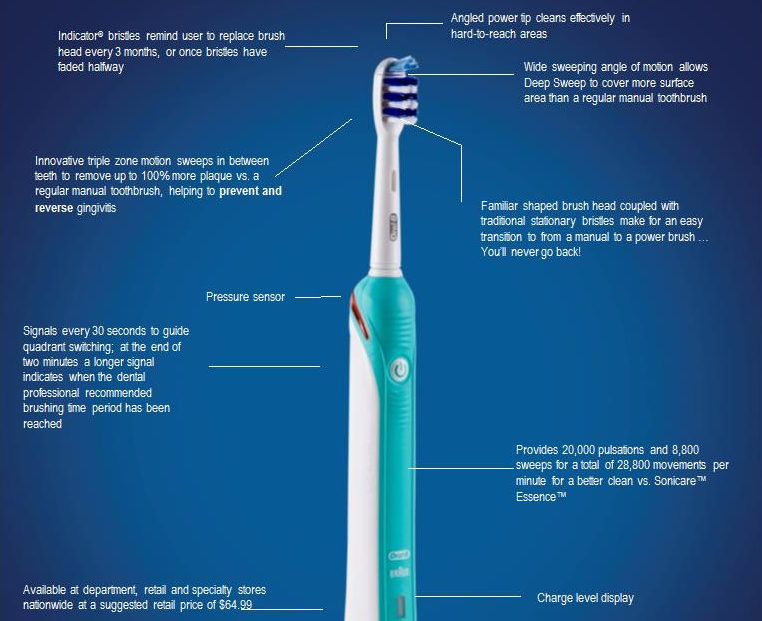 There are so many great features about the Oral-B Deep Sweep 1000 Electric Toothbrush that made me really excited to use it: triple action deep cleaning technology, visual pressure sensor, and my favorite feature: signals every 30 seconds when to switch quadrants! The Deep Sweep 1000 with triple action deep cleaning technology removes up to 100% more plaque, even between teeth. This electric toothbrush features an innovative brush head design with 3 cleaning zones, Deep Sweep 1000 provides cleaner teeth and healthier gums. It is really set apart from the competition by its Advanced Triple Zone cleaning technology: 1) Moving power tip for hard-to-reach back teeth; 2) Shorter, stationary bristles for thorough surface cleaning; 3) Longer, sweeping bristles for deep between teeth! My favorite feature, the Professional timer with quadrant prompt, is a two-minute timer with 30-second intervals helps guide you through the four quadrants of the mouth, making it easy to track how long you’ve been brushing! I definitely RECOMMEND the Oral-B Deep Sweep 1000 Electric Toothbrush. It is by far the best one I have used or seen on the market and my teeth are LOVIN' it! Win It: Oral-B is generously offering (1) Oral-B Deep Sweep 1000 Electric Toothbrush to a lucky winner!